This set of Biochemistry Questions and Answers for Experienced people focuses on “Complementary Interactions Between Proteins and Ligands: The Immune System and Immunoglobulins”. Explanation: The function of TH cells is to interact with macrophages and secrete cytokines that stimulate TC, TH and B cells to proliferate. 2. Which of the following is a function of Macrophages? Explanation: The remaining are the functions of B cells, TC and TH cells respectively. 3. Which of the following is a function of B lymphocytes? Explanation: The remaining are the functions of macrophages, TC and TH cells respectively. 4. Which of the following is a function of T lymphocytes? Explanation: The remaining are the functions of macrophages, B cells and TC respectively. Explanation: IgG is the most abundant antibody found in all body fluids. 6. Which of the following is the largest immunoglobulin? Explanation: IgM is the largest pentameric type of antibody in the human circulatory system. Explanation: Secretory IgA is the main antibody present in mucous secretions and other secretions like tears and saliva. 8. Which of the following antibody first reaches the site of infection? Explanation: IgM which is produced by B cells appears in response to the initial exposure to antigen. 9. Where do T-lymphocytes develop into fully competent but not activated T-cells? Explanation: T cells are called so because they mature in the thymus gland. Explanation: Antibodies can recognize proteins like antigens. Explanation: IgG consists of 2 subunits including 2 heavy chains and 2 light chains. 12. Which of the following is a true statement? Explanation: IgG and IgM are involved in primary immune response. Explanation: IgA occurs in exocrine secretions and defends against bacteria cells and viruses. 14. Which of the following is not a feature of secondary immune respone to an antigen when compared to the first immune response to the same antigen? More antibodies are generated and the generation is fast. Antibody produced has greater affinity for the antigen. 15. Which of the following presents antigenic peptide to T-cells in order to initiate an adaptive immune response? Explanation: Plasma cell is a fully differentiated B cell that produces antibody. 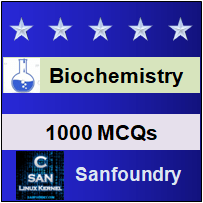 To practice all areas of Biochemistry for Experienced people, here is complete set of 1000+ Multiple Choice Questions and Answers.